Today’s post is written by Rebecca, a dear friend and reader who wanted to encourage you by sharing her own success in lowering her grocery expenses! Confession: I’m guilty of spending way too much money in the grocery store. I used to be the mom who’d run into the store with a short list of one or two items and walk away with an entire cart load of food! My husband would come home from work with a big frown on his face, wondering why on earth we needed everything I just bought when our kitchen was already full… and when my shopping list was so short! Tiffany shares lots of really great tips on her blog, and they’ve been a big help. But no matter how hard I tried, I couldn’t quite get the hang of meal planning and how to use what I had in the kitchen efficiently. I was feeling overwhelmed with it all, so sought help and tried her meal plan subscription. After just a couple months of being a meal plan member, I’m so excited to share that I’ve been able to cut my grocery bill in half – literally! It feels like a huge burden has been lifted to finally have reigns on my grocery budget, and I love that we’re eating healthy, whole foods too! I know that this type of savings sounds a bit shocking, so I compiled this list of practical tips I’ve learned from using the meal plan, hoping you’ll find encouragement with your own grocery budget. 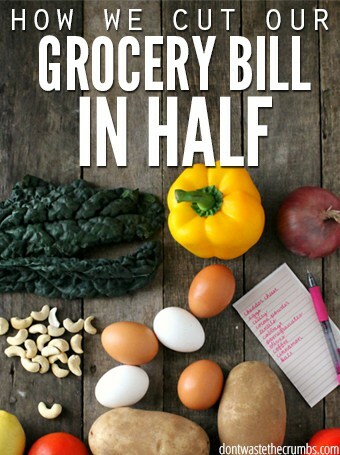 But even more so, I hope these ideas will help you cut your grocery bill in half too! Move over excess and hello simplicity! If you don’t meal plan, here is your chance to start. Create a one week meal plan with a shopping list of items needed to complete your week’s worth of meals. Now wait! Before you jump in the car and go shopping, look around your kitchen and see what you already have. Cross those items off of your shopping list and THEN get in the car and go shopping. With your list of course! The key to making step one work is to stick to the list when you go shopping. No playing around mama’s – stick to the list. Have you ever made a recipe that called for 2 ounces of cream cheese, or 3 slices of bacon? Of course you can’t buy just 2 ounces of cream cheese or 3 slices of bacon, so you buy the bigger package, measure out what you need and put the rest in the fridge. But then what do you do with the stuff you put in the fridge?! Make it a habit of eating from the fridge often, including appetizer-style dinners or buffets on your meal plan. Both are ideal for using up small amounts of several items. If you prefer actual “meals,” chop up all your leftovers and add them to a big salad or a big pot of soup! Just be sure to include that in your meal plan each week! The bottom line is this: Wasting food is wasting money, so do something with what you buy! This may seem strange, but when you know you only have that one bag for trash – for the whole week – you will certainly think twice before putting something in it! Let’s talk about apples. We’ve all thrown peels and cores into the trash before, but did you know that they’re edible? Peels and cores can be added to smoothies, or they can be used to make homemade apple cider vinegar. Bones from meat can be used over and over for homemade stock. The ends and peels of onions, carrots and celery? These can be added to homemade stock for flavor. Before you reach for the trash can, think twice about what’s in your hand and see if you can find a way to use it up! Don’t worry. It’s not as difficult as it seems. I’m not much of a meal planner myself, and never have been. I find it difficult, tedious and often end up eating the same boring meals over and over anyway. That’s why I truly love love her meal plan membership. Unlike me, she’s got the knack for meal planning and her team has done all the hard work for people like you and me. 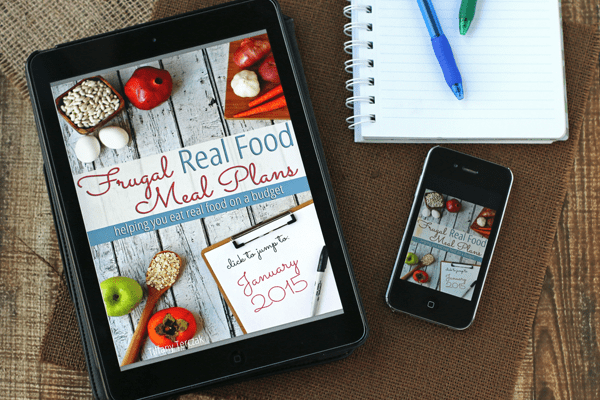 Not only is her meal plan 100% real food, but it’s created with a frugal budget in mind. That means no wasted ingredients, no wasted food and I can shop the whole shopping list at my regular neighborhood grocery store! Honestly, her meal plan is more than a money-saver. Knowing what’s on the menu for every day of the month saves me time and sanity! How Much Do I Actually Save? I’m sure you guys are curious about the numbers, and while I’m a bit embarrassed to share, I know it’s for the greater good. For my family of four, I used to spend between $600-800 per month. 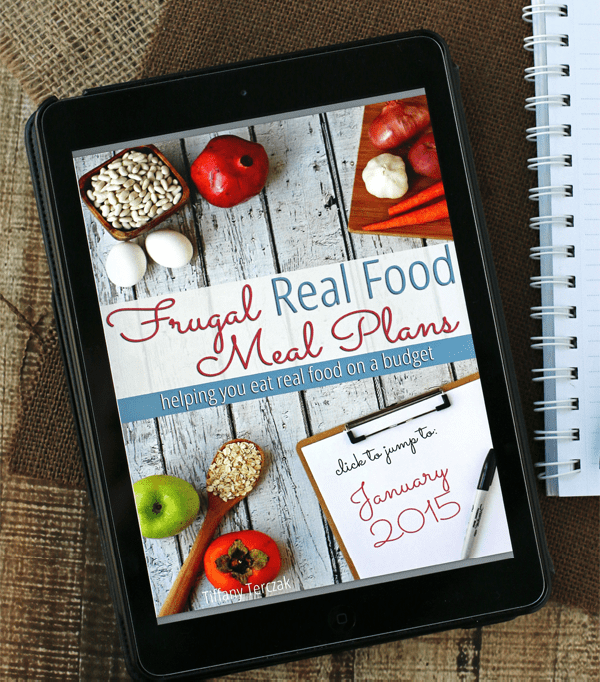 Using the meal plan on regular basis, I am now spending around $400 per month. I’ve even even gotten my grocery bill as low as $350! I’m utterly shocked by how little food we waste now, and we’re enjoying home cooked meals from scratch. No more convenience foods, despite my deep addiction to Chick-Fil-A! Some people think it’s strange to pay for a meal plan, but it’s taught me how to spend wisely, shop smarter and be a better steward of what I already have. It’s also saved me a countless number of hours and headaches, and it’s cut my grocery bill in half each month! For me, it’s worth it. I save WAY more than the cost of the membership ($10/month) every month, and gaining back my sanity is priceless! These three tips can easily save you hundreds in the aisles of any super market. If you prefer the easier route like me, give the meal plan membership a try for one month and let someone else do all the hard work for you!